I think the gray one is whats in their now. My car usualy never gets that hot, only when flushing the coolant. However I have noticed she runs warmer this year then last, hmm strange. I'm curious on how you did that. Did you have spare switch positions.......or modified the dash??? I had the useless antenna up/down switch which was elliminated in favor of the auto up from the aftermarket radio. I then removed the switchplate and used the backside to create a three cutout pattern in 1/4 in. plexi. This would ensure the proper size and spacing between the switches After cutting out the patten on my template I fixed to to the backside of the switchplate so as to have a flat work surface and transfered the switch cutouts to the switchplate using a router. This worked well, in retrospect I should have opted for a finer router bit to minimize some rough edging on the face side of the switch surround from chipping the veneer. 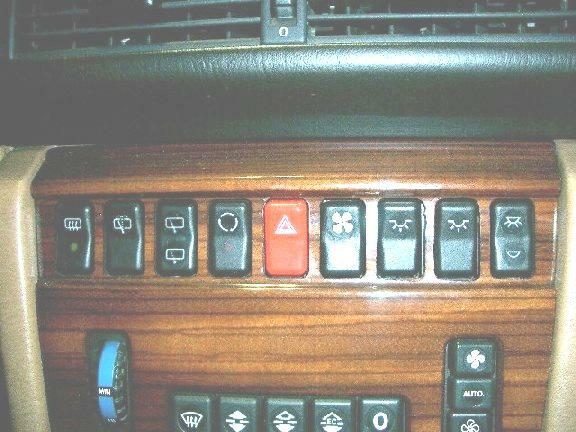 As to switches used, the hi/lo is a w124 rear wiper sw on/off/on, the other two override swiches for the main cooling fan are dome light switches simple on/off. I canabalized a fan switch emblem for my aux fan and glued it in place, it lights up as night though albeit cobbled. I forgot to mention that the rear of the center console has cutouts for a full gang of switches, the switches themselves usually plug into a harness, lacking in my case but could have been used. The design of the assembly allows placement of extra switches and wiring without a harness as the top switchplate holds them all in place securely. Last edited by Brian Carlton; 07-11-2006 at 08:09 PM. Now that we can see the photo that's a terrific job. Those switches look like they came from the factory! Maybe I'll see if I can add some to the SDL. I'd sure like to control the aux. fan from the console. The two pole switch is the likely candidate for the fans. This switch closes one contact to start the fans at 105°C. and then it has a second function to shut the a/c compressor down when the temp hits 120°C. This would be about 1° before you crack the head on that engine. I researched back through some old posts and found where gsxr explained there are as many as four temp sensors on the 603 in different locations depending on year and model. On mine, the two pole switch is actually the afterglow temp sensor to the afterglow relay on one pole and the other pole goes to the interior temp gauge. The other (single pole) switch on the water outlet is for the Electronic Diesel System sensor. The auxiliary fan/AC protect switch should always be a 3 pole switch, in mine behind the IP with little to no access. The car always runs hot, between 100°C - 115°C in ambient temps above 85°. I did find an aux fan burned out and the other feels bad (both original) so I am replacing both. And while they are out, I was able to flush 15 years of all kinds of debris (6 species of slow flying creatures) out of the condensor and radiator. The flush work alone lowered the average temps by about 10°C without the aux fans. With the new fans I expect more improvement but I don't want the temps to go as high as 105°C to engage the fans. One of the old posts talks about a modification to the temp switch harness using a "cool harness" addition with an embedded 1/4 watt resistor to trigger the aux fans to engage at a lower temperature. Has anyone used this modification? I found more info about it at the inventors site [URL="http://pages.prodigy.net/jforgione/MB_S500.html"] and I contacted him to confirm its real. I ordered the red today (with about $870 in other parts) so I'll let ya guys know how it works out. The red switch that HitMan is referencing above will start the aux. fan at 100°C. This temp. is an ideal point. Any lower and it will be running almost continuously in hot ambients. Why bother with custom resistors and all that associated BS? That vehicle does not have the three pole switch like the older 603's..........controlling the aux. fan and the compressor cutout?? What switch signals the Klima on that one?? 2) Triggering the electric fan at a lower speed is, IMO, a waste. With a properly functioning cooling system - including the mechanical fan & clutch - the temps should *rarely* exceed 100C on a diesel, let alone get to the 105C trigger point for the electric fan. Even in the recent heat wave here (100-105°F ambients), my 87 has refused to hit 100°C on the dash gauge. The electric fan never, ever turns on high speed. 3) Remember that the electric fan doesn't move much air anyway... a small fraction of what the mechanical fan moves. My 300E had a bad fan clutch, and although the electric fan was running on high, that was NOT enough to keep the temps under 110°C! Only fixing the fan clutch did that. I don't know what the CFM rating is on that fan but from what I can tell, it ain't much. One of the old posts talks about a modification to the temp switch harness using a "cool harness" addition with an embedded 1/4 watt resistor to trigger the aux fans to engage at a lower temperature. Has anyone used this modification? I found more info about it at the inventors site [URL="http://pages.prodigy.net/jforgione/MB_S500.html"] and I contacted him to confirm its real. How to eliminate oil dependency through market-driven approaches. Red one works fine as I installed it a few days back. Is there a drawing or depiction of what should be jumpered on that? I’m just not fully read in to the operational philosophy of the switch - I assume there’s 12V in and then two switches that get 12v to two relays or actuation points? Not sure if the presence or lack of 12v causes a compressor shut down?? Or do those switches close one contact at one temperature and open another at a different temperature?? The control system changed as of USA model year 1988, IIRC. 86-87 use a simple switch, 88-up use a sensor, not a switch (there is a difference). We can't answer your question without knowing the year & model of your car. The member is referring to an OM603.